If you are reading this blog you know what I think of our voyages aboard Pandora including our trips south over the last few years on the ICW and Bahamas, Cuba and most recently the eastern Caribbean, as we do the “snowbird” thing. Now, you can learn what Brenda’s take on all of this is. The differences may amuse you. 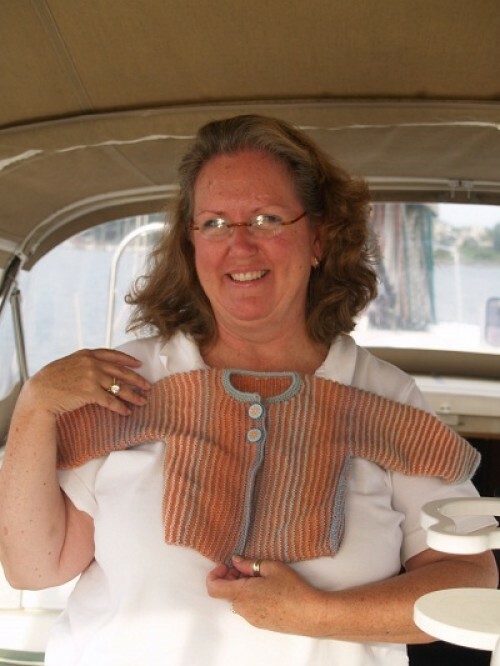 This is Brenda, knitter and fiber artist extraordinaire and sailor reluctant but willing (usually and for over 40 years so far). 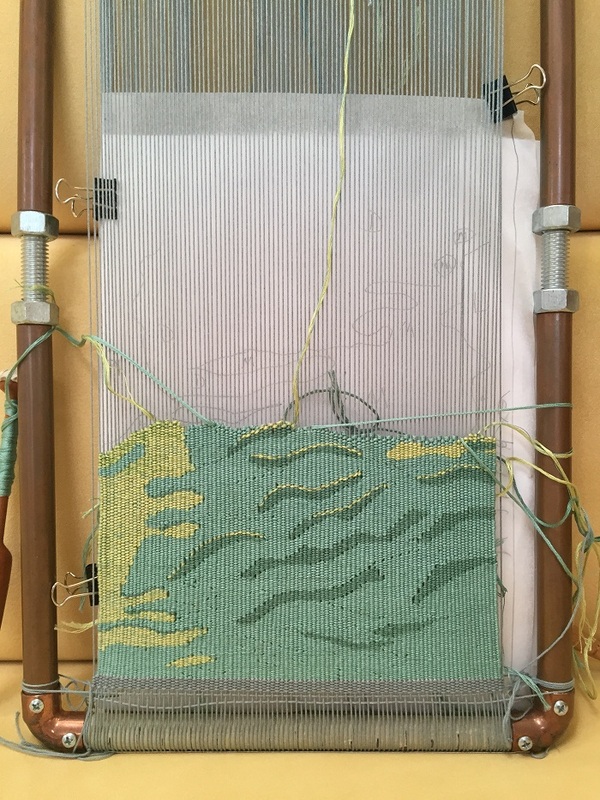 This is only one of the 8 plus projects that she completed on a recent winter afloat. 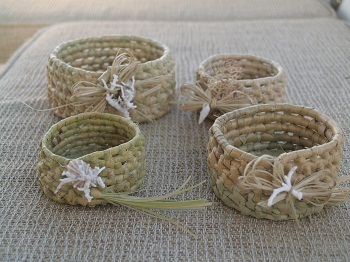 Brenda has also became a pretty good basket weaver when we were in the Bahamas using local palm fronds. Not bad for a beginner. Time afloat is beginning certainly beginning to creep into her work. Here is a piece that she worked on the winter of 2015 aboard Pandora. And this is a small scale piece that she completed and showed at various venues over the last few years. Wow, amazing….you rock Brenda! We want to keep hearing more about your sailing adventures along with your beautiful knitting projects. 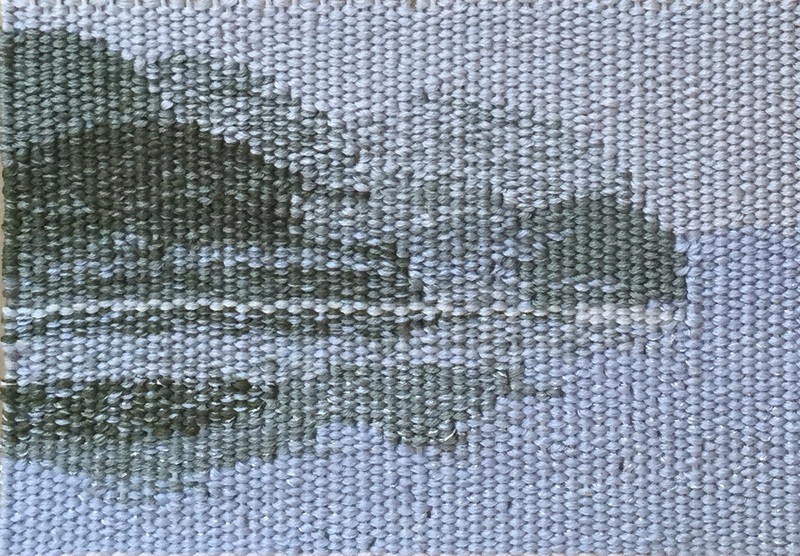 Also, would like to learn more about the fiber art you’re creating along the way. Especially exciting is how you find natural plant dyes for your fibers. Then make extraordinary works of art. I’ll be reading along as you sail along…. Lynda: So great to hear from you. I guess that you and Brenda are in touch now. It would be great fun us to connect with another fiber junkie. Once again Brenda enlightens us about all things fiber art, most recently about the production of silk in Connecticut by means of a presenter from the Mansfield Historical Society. Wouldn’t it be fun to start a movement and get a historic silk worm farm going again; similar in spirit to the historic perfume factory in Grasse, France. Preserving history is so valuable, to learn about the specifies of different Mulberry trees and silk worms. While on tour of botanical gardens in the Northern Lakes of Italy we came upon a once silk worm farm. At one time the Northern Lakes of Milan, specifically Como, were well noted for their production of silk. But when either the wrong type of worms, or perhaps they were fed the wrong type of mulberry leaves, came about one year, all the crops were destroyed. That was in the 1800’s. I’d have to dig out some facts. There were blocks on the walls to print on the silk, patterns of brocade and other motifs fashionable for the time. Now, that area is known for printing on imported silk scarves. Also Brenda, your jacket looks fabulous on you and trust it will be finished up in no time. If not already finished up by now. So much wonderful information and rich history…..many thanks to you Brenda. Can’t wait to hear more…..
You are so nice. I passed this note along to Brenda. She will be thrilled. She gave a tapestry talk at a gallery opening yesterday.